Jack Barrymore in transition. He was still the romance leading man, with added patina of being a most celebrated of actors. JB was something special to sell, as opposed to chisel-faces in sock and smooch mode. State's Attorney was visited in a previous Watch List, thus delve to selling aspect. Here was RKO spreading word of His (as in JB) First Great Modern American Role. Was it actually? 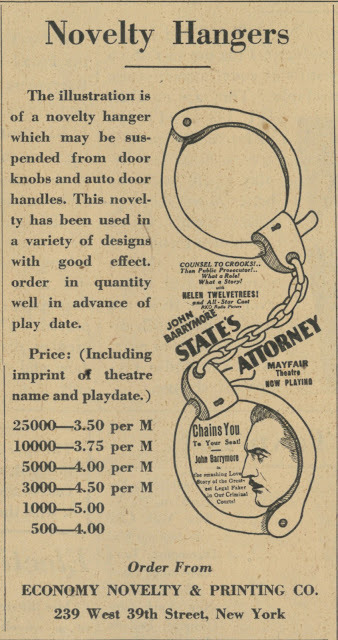 There'd been lots of stateside comedies for Barrymore's start in movies, but those were years before and silent. Close look at past hits was reminder that even contemporary-set Barrymores tended to take place in foreign locales: Grand Hotel, Arsene Lupin, others. State's Attorney was modern, and thoroughly American, for stripping veils off legal chicanery, JB attacking juries as he would a first night audience. 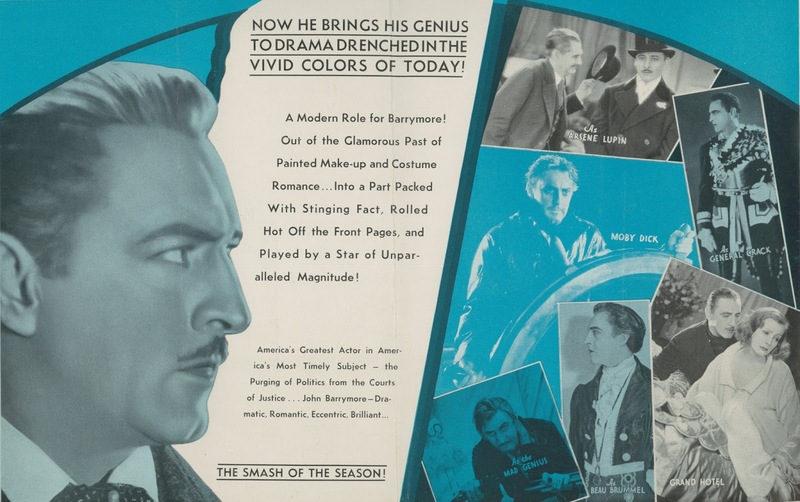 The way RKO merchandising tags "Out of the Glamorous Past of Painted Make-Up and Costume Romance" (above) has an almost Good Riddance subtext. Had Jack put paid to puffed sleeves and past-set folderol? His status as the Screen's Greatest Lover was intact, but for how much longer? I like the "news" plant about RKO secretaries ducking work to watch him emote. 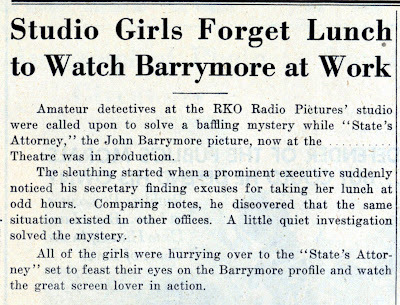 The article says they skipped lunch to hurry over to the State's Attorney set "and watch the great screen lover in action." Could clerical help so readily enter a sound stage where they otherwise had no business merely to "watch"? If so, it must have been whales of fun being an RKO employee, though I'd have been hard put choosing between State's Attorney's set and blueprints being drawn for King Kong. "Rolled off the front pages, " indeed, and with all the subtlety and depth you'd expect from any five star edition. Not that "State's Attorney" is all that bad. Actually, it's quite entertaining, thanks to a powerful and incisive Barrymore performance and the eye-candy of Helen Twelvetrees, but what melodramatic claptrap it is. 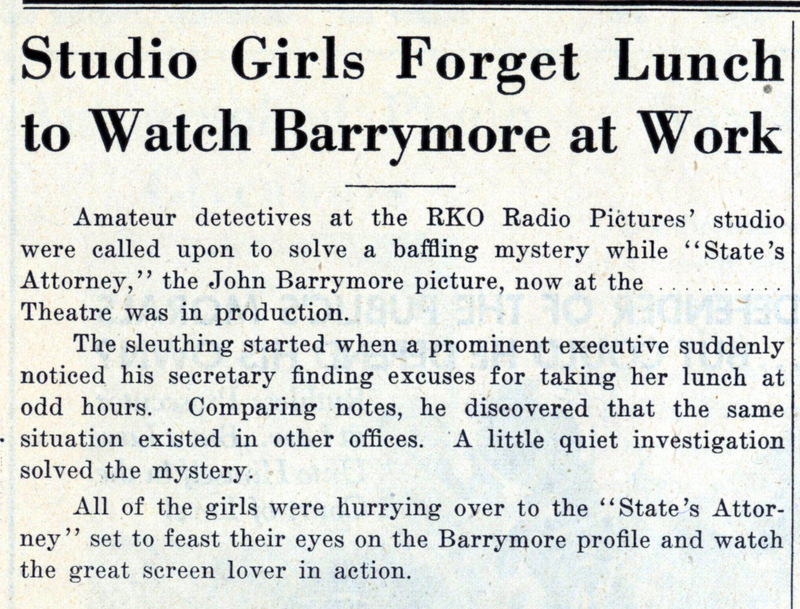 It's the sort of thing Warren William would be doing for Warner Bros. and probably a reason why he was compared to Barrymore then. I like Warren William a lot, but pulling off a picture like "The Mouthpiece" is one thing, doing a "Counselor at Law," is something else. It's only when a piece of music calls for the high notes that the truly great have an opportunity to distance themselves from the lounge singers. 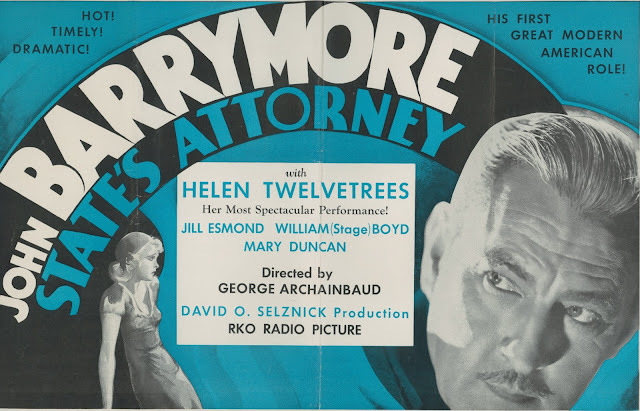 The one really regrettable aspect of "State's Attorney" is that we're only too aware of what little time Barrymore had left. His will and talent held at abeyance the ravages of a dissipating life style, but not for much longer. This was a lost opportunity.